Which is more overdone in music documentaries, jazz experts constantly extolling the virtues of unsung artists you have never heard of, or directors who insert themselves into their stories? The thing about Raymond de Felitta’s ‘Tis Autumn: the Search for Jackie Paris (trailer here), a documentary about the underappreciated jazz vocalist and guitarist, is that it does both, in ways that are actually appropriate within the context of the film. Jackie Paris was indeed a neglected figure in jazz. Even now, most of his CDs are available only as Japanese imports, although several are up on i-tunes. The interview subjects testifying to his musical talents include major jazz figures, like Dr. Billy Taylor, Teddy Charles, James Moody, Ruth Price, Howard Rumsey, Mark Murphy, and Phil Schaap. 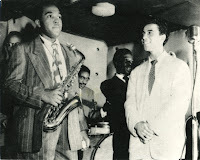 He even toured with Charlie Parker for six months at the altoist’s request, but never recorded with Bird. Paris did not lack for famous cheerleaders either. Dr. Taylor played his records on his radio programs. Peggy Lee arranged an ultimately unsuccessful audition with Capitol Records. Lenny Bruce drafted a long passionate letter on behalf of Paris to a showbiz power broker, but never mailed it. (Autumn sees this as mysterious, but from what we know about Bruce, we can probably speculate the drugs had something to do with it.) Somehow the breaks always went against Paris, which is one of the mysteries Autumn explores. Reportedly, he spurned offers of mafia management, which is offered as a potential explanation for his career woes. Autumn starts with what seems to be another comeback attempt for Paris, booked for a stand at the Jazz Standard. Film director and jazz pianist de Felitta came to hear the voice he only knew from import CDs and meets the man himself. As a result, he befriends Paris, and begins making the film, which culminates with the answer to its central mystery—did Jackie Paris have a child whom he never knew? As de Felitta pursues leads, his presence in the film makes sense. There are a few scenes of him which should have been cut, as when he visits a New Jersey record show looking for rare Paris records, but overall the director’s presence is necessary for the story telling process. In both cases, Autumn gets away with its jazz documentary clichés. Autumn is notable precisely because it does not simply engage in hagiography, rather giving a surprisingly balanced portrait of Paris. Despite pursuing the mysteries of the vocalist’s private life, it does keep the focus largely on his music, including some tracks that have not been commercially released before. One such tune, “I’ve Had a Heck of a Time,” is a pitch-perfect choice to run over the concluding credits. Paris did deserve better. 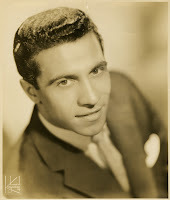 After all, this was the first vocalist to tackle Monk’s “‘Round Midnight.” His albums like The Song is Paris should be considered jazz classics. Autumn makes an effective case on his behalf, wisely selecting some fantastic music to make its points. It is currently playing in New York at the Cinema Village.